A PhD degree is not a souped-up Bachelor degree. You need to have very good reasons, the discipline, and the capability of pursuing a postgraduate research degree. Some students go through a self-inflicted torrid time during their Masters or PhD programme in local Malaysian universities. There are many reasons for this, but they can be grouped into two issues. These students often have: 1) a wrong evaluation of their interests and capabilities, and 2) a wrong expectation of the amount of self-reliant work required from them in their postgraduate studies. So, before you fill in the postgraduate study forms, you need to ask yourself the following questions. 1. Why do you want to do a research postgraduate study? This is the most important question students should to ask themselves, but yet, students often neglect to do so. Doing a postgraduate study is not a customary progression after completing your first degree. And you should not do a Masters or PhD simply because some of your friends are doing it, or because you cannot find a job, or because you feel aimless after graduation. Unbelievably, one of my former (and failed) students once disclosed that she wanted a PhD simply because she like the title “Dr.” to precede her name! Some students also do a PhD with the belief that their employers would increase their salaries or their social status would rise. A research postgraduate study should only be pursued if (and only if) you are interested in research or academic work. What you might be unaware is doing a research postgraduate study would limit your career options to only those in research and teaching. And even if you do find a job that is unrelated to research, do not expect your employer to pay you according to your highest training level. In other words, you would be paid according to your first-degree level. But in most cases, your job application would likely be rejected because you would be deemed over-qualified. 2. Do you have sufficient money? Another often neglected question is to ask is if you have sufficient funds to support your postgraduate study. A Masters study would take two years, and a PhD four years. Shockingly, some foreign students have little qualms coming to Malaysia with insufficient money. God willing, they might say, part-time work or additional money would come later. Shockingly, some students pursue their postgraduate studies with insufficient financial means. Although plenty of scholarships are available to local Malaysian students, these scholarships are typically unappreciated. These scholarships actually act to cause students to be lazy and slow down their work progress (photo from www.themalaysiantimes.com.my). When you are stressed out thinking of money, is there any room left in your concern for your research? To put it simply, you must have sufficient funds to pay the tuition fees, accommodation, food, and other expenses. And, no, part-time work is never a good option for additional income. The job, even though part-time, steals your precious time from research work. You must be fully focused on your research work. My students who have part time jobs have never been able to give their best effort in their research or to complete their studies in time – never. 3. Can you get a scholarship? And would you even appreciate the scholarship if you get it? Supervisors in Malaysian universities are blessed with ample research projects and with ample financial support for student scholarships. However, these scholarships are competitive. There is no guarantee you would get it because supervisors often have more than one student under their wings. Do not be surprised that a supervisor can have as many as five to twelve students at any one time. My university, UPM, along with five other universities, is recognized as a Research University. This means, UPM gets additional funds to offer scholarships to postgraduate students. Local Malaysian students find it relatively easy to obtain one form of scholarship or another. Now, ironically, comes the problem with abundant scholarships. With plentiful of scholarships available to Malaysian students, you might think this would make these students work even harder and more appreciative, right? Wrong. Easy access to scholarships only makes some Malaysian students lazier and slower in their research work. Foreign students have it harder. The only scholarship available to you in Malaysia is through your supervisor’s research funds. You need to ask your prospective supervisor even before you apply for a postgraduate study if he or she has sufficient funds to support you. 4. Is your family or partner supportive of your studies? What most students fail to realize is doing a Masters and particularly a PhD can disrupt your family life and social relationships. I have seen more than one case where parents threaten to disown their children because their children wanted to pursue a postgraduate study. This is because some parents fail to appreciate or are naïve about postgraduate studies. These parents think a postgraduate study is an unnecessary and additional financial burden to continue to support the children’s seemingly never-ending studies. Support from family members and/or your partner can be crucial in your postgraduate study. They can derail your studies as easily as they can support you (photo from www.mc.vanderbilt.edu). I have seen one of my former students receiving ridicule from relatives and even from family members when they compare her to her ex-course mates who have already graduated (from Bachelor) and who are earning good money while she still slogs through a Masters programme. I have seen a marriage end up as a divorce because the wife cannot stand being alone for long periods whilst the husband was busy at the field or lab. I have seen a long-term relationship break up due to one partner (girlfriend) pursuing a PhD, while the other partner (boyfriend) was not. Intellectually, it appeared, they grew apart. On a personal note, my own ten-year-old relationship with my former girlfriend broke down because of my long absence while I pursued my PhD in the UK while she remained at home in Malaysia (no, long distance relationship do not work). I have seen one student who was so completely stressed out from his PhD that he was admitted to a hospital mental health ward … twice. And I have seen both husband and wife (both PhD students at the same time) stressed out of having to take care of their newborn baby, their financial difficulties, and their respective research; so stressed the husband was that he was close to tears as he disclosed his troubles to me in my office. Doing a research postgraduate study is stressful because it competes with your family or your partner for your time, energy, devotion, and concentration. So, you may be ready to do a PhD, but is your family or partner ready? 5. How is your English? “…factors of aggregate stability can interact with one another; meaning that a factor may not, by itself, have a unique contribution to aggregate stability. Instead, it jointly contributes with another factor or factors to affect aggregate stability. Such jointly contributions cannot be measured by simple linear regression or by correlations…”. So, if your command of English is less than desired, how far are you willing to work to improve it? You simply cannot escape achieving at least a good level of English language proficiency in science. 6. Are you willing to learn to read and write a lot? Laziness to read and write scientific papers is a key problem among postgraduate students. Part of this problem is the poor level of English proficiency among the students. Plenty of reading is required in research postgraduate study (photo from srpp.com.au). You need to start reading—and read a lot—early in your research work. You need to understand the problems, gaps in knowledge, issues, and latest findings in your research area. When you read enough, you feel more confident and competent in your work. Instead, students often start to read only when it is time to write their thesis. And how much should you read? One journal per day, as once pledged by my former (and failed) student? No. You read as much as you can or as needed. Contrary to a common notion among students, you do not have to read a book or journal paper from front to back like a novel or story book. You only read parts of a book or paper that are relevant or for information you require. Yes, there would be books or papers which you will read front-to-back and many times over because they are most relevant to your research, but certainly not all documents should be treated as such. Unfortunately, poor comprehension and low concentration skills hamper reading. Students may understand the individual words that make up a text, but yet fail to understand what the whole text means. Lastly, you need to write. You must get your research published, but not just in any journal, but also preferably in high impact journals. Unfortunately, there are many so-called scientific journals out there, ready to publish your work, sometimes as fast as within a week. These journals require payment, which itself is not unusual because some high impact journals do carry page charges, but the problem is these so-called journals carry low quality research papers, sometimes complete with grammar and spelling errors and missing references. Self reliance is a very essential ingredient in all good research students. Masters and PhD study is a test on independent work. You must plan your research work and keep to the schedule. It isn’t your supervisor’s duties to accompany you to the lab or to the field all the time. Self reliance is crucial in research. It means able to go out to the field to collect data, for example. This was one of my previous research with my former student. It is your supervisor’s duties to provide financial support for your research (such as to purchase chemicals or research equipment) or networking assistance in any research collaboration with external organizations. But, ultimately, it is you who have to plan and setup the lab and/or field experiments, collect and analyze the data, and interpret the results. This includes solving problems that often crop up unexpectedly in research work. Your supervisor guides and advises you in your research but not do all of your statistical work and interpret your analyses. Self reliance is such an important criterion that it cannot be stressed often enough. Used to being spoon-fed with information and work being carried out for them, students often struggle to prepare, let alone execute and complete, a series of experiments on their own. Deadlines are never self-imposed, so their work is often completed late and shoddy, lowering the quality of research. Self reliance also means self study, where you learn to overcome your knowledge deficiencies through reading, consultations, and hands-on practice. No one knows everything or is talented in all aspects. The crux is being able to seek out the relevant information and to do it diligently to overcome our knowledge or technical skill weaknesses. Consequently, these seven questions are essential questions you need to ask yourself. 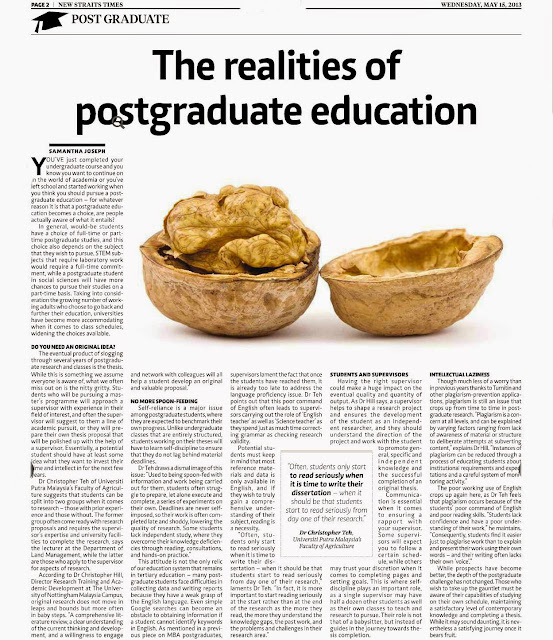 This article is not about the nitty-gritty details about postgraduate application, as universities’ websites carry those information, but it is about whether you should be pursuing a Masters or a PhD programme. My PhD student, Mohsen, and I (left) discussing about some finer points in his research project. Stress, difficulties, sleepless nights, and delays are part and parcel of any research work. In fact, they are to be expected. But what becomes an unrewarding Masters or PhD experience is when students come unprepared in terms of insufficient financial means, wrong attitude and expectations, and inadequate basic knowledge and skills. Do not be surprised that a supervisor can have as many as five to twelve students at any one time. Searching for an exploration chemicals provider online can be exceptionally dubious with the legitimate issues included.